Men's Sterling Silver Link Bracelet Crafted in Bali, "Wanen Links"
Designed by Balinese artisan Komang Suastra, this men's bracelet is bold and brave. 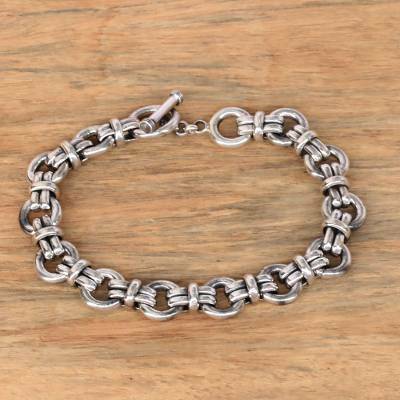 The bracelet is crafted of sterling silver, circling the wrist with intricate links. Komang names the bracelet Wanen, a Balinese word meaning "brave." You can find men's sterling silver link bracelet 'Wanen Links' by Komang Suastra in jewelry categories such as No Stone Bracelets, Silver Bracelets, Sterling Silver Bracelets and Link Bracelets. Enjoy exploring these sections for other Novica treasures. "Excellent design and craftsmanship "
Beautifully made and crafted with quality.